Chances are, Martin Bisi isn't a name you're familiar with. But if you've taken even a passing interest in the worlds of noise-rock, alt-rock or experimental music over the past 35 years, you can be confident his work is something you're already aware of. 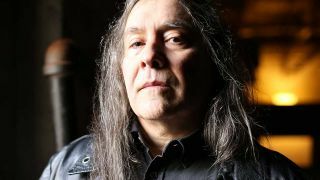 Having founded his legendary BC Studio with friends Brian Eno and Bill Laswell in Brooklyn in the early 80s, Bisi went on to record landmark albums by a number of household names – Sonic Youth, Swans, Unsane, Cop Shoot Cop, The Dresden Dolls and Brian Eno among them. Meanwhile, Bisi himself contributed to albums by Iggy Pop and The Ramones during the course of the studio's history. Now, with Bisi's pocket of Brooklyn being swallowed up by the slow creep of gentrification, BC Studio finds itself under threat. While a compilation was released in 2016 to mark the studio's 35 birthday, a second instalment is due to on April 19, to celebrate the studio's history and cement its profile under the increasing threat of closure. To mark the release of BC35: Volume Two, Bisi joins us to guide us through his 10 favourite albums to come out of BC Studio over the past 35 years. "Starting in ’89, Cop Shoot Cop went against the grain of heavy music by eschewing guitar. They used 2 basses: one high-end, one low-end and a sampler, which at the time was also novel. This song is about government, generally, but with the American one in mind. Members of Cop Shoot Cop contribute to both volumes of the BC35 albums." "The track In The Kingdom #19 has Mike Watt of Minutemen on bass. It's the most experimental song on this album. In the fade, at the end of the song, you hear Watt say 'In panic I forget it/In despair I need it/In my mind I save it/In death I have it.' And with the song almost faded out, Thurston Moore follows, reciting more of Watt’s words: 'Never gave a damn about the meter man, until I was the man who had to read the meters, man.'" "Live Skull played their last show with bassist Marnie Greenholz at CBGBs in 1988. And they came in the next day to my BC Studio and recorded this. This band were perceived as an alternative to Sonic Youth, who were contemporaries and in the same scene in New York City. Live Skull reunite on both volumes of the BC35 albums." "When we turned this in, I got a message from the label, Matador, that something was wrong with the masters. I started to worry, but then there was a follow up; that they'd played it for Gerard Cosloy, the label head, and he said that's how it was supposed to sound. Sonically over the top – vocals distorted through a Rat pedal – and the cavernous room of my studio where the drums were recorded visible in the video." "The rhythms here are mostly programmed. So we took those various sounds and re-amplified into my rooms at BC Studio, whose acoustic properties, being largely stone have a certain violent quality." "This is one of my latest recordings. It’s the project of Dan Friel from Parts & Labor. On bass and joining on vocals is Zach Lehrhoff, who I previously recorded in the band Ex Models. Here we did something fairly rare for me – overdriving my console itself. So it's very distorted, which goes well with the melodic vocals. The title track features choruses of distorted kazoos." "This band was from Kansas City. Math-rock purists, but also quite psychedelic. Today they would probably be considered a noise band." "The percussion and drums here are Thor Harris, who's been in Swans for several decades. J.R., the singer and guitar/bass player, said he thought many of my productions sounded like a 'sewer' – meant, and taken, as a high compliment. I would think of this during the mixing process here." "For me, this is the best of a certain Swans era. It was an agonisingly long mix, as I remember. But you only get out, what you put in!" "This is a duo with contrasting vocals: Charlie Looker does Medieval/Gregorian sounding chants, and Andrew Hock is guttural. This works very well for the drama. There's a nice combination of guitar wash, and metal precision generally." BC35: Volume Two will be released on April 19 and is available for pre-order now.